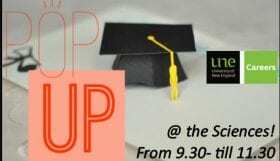 UNE Careers will be popping up again!! This time at Arts Building, A2 Lecture Theatre on Thursday, 10 May 2018, 9.30am-11:30am. Careers will be located near A2. Please come along and chat with us if you are not sure about your current course, how to gain employment, graduate employment and much more! For the off campus students, you can call us on 02 6773 2000 to discuss your options or email in on careers@une.edu.au with your questions. Don’t forget we have UNE Careers Online https://moodle.une.edu.au/course/view.php?id=2153&section=19 resource unit which all students are enrolled in.